I recently came upon the charter of the Constitutional Society of Virginia while reading through the correspondence of Joseph Jones. Jones, a Virginian leader, was uncle to (and guardian of) an orphaned James Monroe. Monroe received much of his Patriot beliefs (and later, Anti-Federalist attitudes) from the time he spent with his Jones. Joseph Jones spent a total of six years representing Virginia in the Continental Congress. He grew close with Thomas Jefferson and James Madison, as well as maintaining a correspondence with George Washington. The Constitutional Society of Virginia was the brainchild of Filippo Mazzei. Mazzei, an Italian immigrant, moved to Virginia and purchased land from Thomas Jefferson to start a winery. When the winery failed, Filippo returned to Italy to send information regarding the war back to Governor Jefferson. As the Revolution came to a conclusion, Mazzei returned to Virginia. Filippo was an ardent supporter of republican values, which led him to establishing the Constitutional Society. The main purpose of this Society was to make the State Government transparent to all of its citizens. The Constitutional Society of Virginia was formed in June of 1784. It consisted of members of the Virginia General Assembly and the mission was to publish, free to the public, relevant issues of the time. During the Founding Period, almost every politician believed that an informed populace was the only way to maintain freedom in a Republic. The goal was to make sure all the wealthy, landowning men who were eligible to vote were up to date on any issues facing their State. As a side note, it is imperative to remember that, while the Founding Fathers extolled the virtues of republicanism, almost every one of them feared a democracy. ‘Mob rule,’ as they phrased it, seemed only to lead to anarchy. This, they assumed, was because keeping ALL the citizens up to date on EVERY topic would be nearly impossible. As for the Constitutional Society of Virginia, this organization met three times that June. James Madison wrote up the rules for the club and John Blair was elected president. This club, however, did not last. The reasons for this are not known, but it likely has to do with Filippo Mazzei returning to Europe. As the main driver behind the Society, Mazzei’s departure seems to have cooled any enthusiasm the other members carried. Part of the Society’s charter stated that each member should write an article to be discussed every six months. It seems most of the men involved did not make this happen and, although Blair called a meeting the following year, we don’t know if that meeting ever took place. For me, the most interesting thing about the Constitutional Society of Virginia is the list of men who signed the initial charter. Just three years later, this group would be split fairly evenly about whether or not to ratify the United States Constitution. Four of these men (James Madison, John Blair, Edmund Randolph, and James McClurg) would meet in secret to write the US Constitution, seemingly defying their goal of transparent government (though to be fair, Randolph and McClurg did not sign the document (and to be more fair, Madison would write a large number of The Federalist Papers to educate the public)). The Constitutional Society of Virginia's Charter can be read in full here. There is no study I could find on the subject other than the footnotes in the link above. That's why I decided to provide this article. 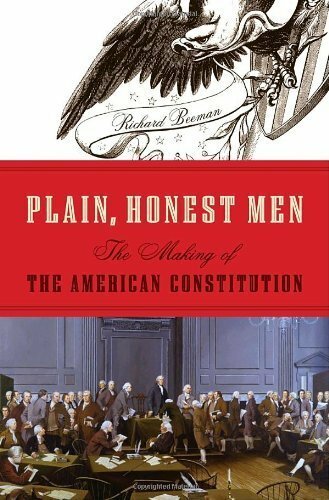 You can pick up 'Plain, Honest Men,' our Book of the Month below and read my review here. The links go to our affiliate Amazon and support this site at no extra cost to you. Jun 18 Benedict Arnold Was An American Hero?